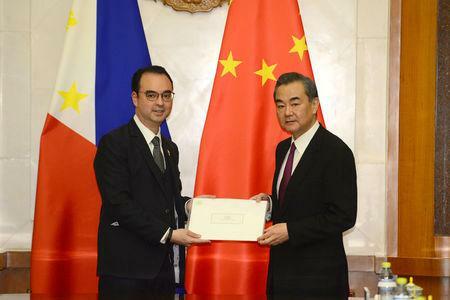 BEIJING (Reuters) - China will prudently advance cooperation with the Philippines on joint oil and gas exploration in the South China Sea, China's top diplomat State Councillor Wang Yi said on Wednesday after meeting his Philippine counterpart. 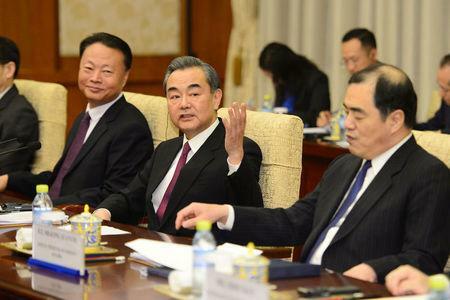 "We will enhance maritime dialogue and pursue equal footed and friendly consultation and in a prudent and steady way advance cooperation on offshore oil and gas exploration," Wang said, without giving details. However, pursuing a joint project would be extremely complex and sensitive, as sharing oil and gas reserves could be seen as endorsing the other countries' claims. "The Philippines and China are finding a common legal framework to conduct joint exploration and surveys. And with our discussions today I'm confident that we will find a suitable legal framework for our differences," Cayetano said. Philippines President Rodrigo Duterte has said China has proposed joint exploration that was "like co-ownership" and better than the two fighting over it. 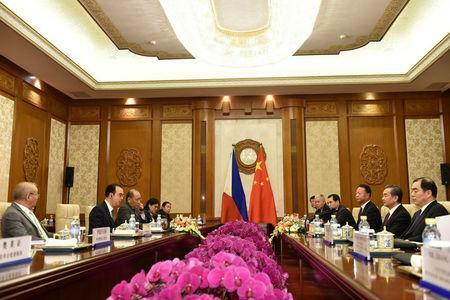 The Philippines suspended exploration in the Reed Bank in 2014 to pursue a legal challenge to China's territorial claims. Included in a 2016 ruling by the Permanent Court of Arbitration in the Hague was a clarification of Manila's sovereign right to access offshore oil and gas fields, including the Reed Bank, within its 200 mile Exclusive Economic Zone. The Philippines, China's CNOOC Ltd and state-owned PetroVietnam jointly surveyed the Reed Bank from 2003 to 2008. The Philippines' ties with China have warmed under Duterte, who has put aside territorial disputes in exchange for trade opportunities and pledged financing for infrastructure projects.